We spend plenty of time here on The Millions telling all of you what we’ve been reading, but we are also quite interested in hearing about what you’ve been reading. By looking at our Amazon stats, we can see what books Millions readers have been buying, and we decided it would be fun to use those stats to find out what books have been most popular with our readers in recent months. Below you’ll find our Millions Top Ten list for August. Lots of action this month as our Hall of Fame absorbs three mainstays from the past six months: Lincoln in the Bardo, A Separation, and Scratch: Writers, Money, and the Art of Making a Living. This marks George Saunders’s third entry into the Hall of Fame. He’d previously reached those hallowed halls for Tenth of December and Fox 8. Meanwhile, The Nix dropped from our list after two months of solid showings. If he’s reading this (because who isn’t?) then hopefully Nathan Hill can look to two other titles on this month’s list for solace. Both The Stories of Breece D’J Pancake as well as Otessa Moshfegh’s Eileen are examples of books that have graced our monthly Top Ten one month (June, in this case) only to drop out for another (July), and then reappear (August). If they can do it, so you can you, Nix fans! The remaining two spots were filled by new novels from Laurent Binet and Victor LaValle. The new book turns Roland Barthes’s accidental death in 1980 into a murder investigation set against French intellectual life. With a cast of characters that includes Michel Foucault, Jacques Derrida, and Julia Kristeva with guest appearances by Gayatri Chakravorty Spivak, Umberto Eco, and John Searle, it’s no surprise Binet’s book is way more dizzying than most detective stories. What is shocking, though, is how it manages to respect the theories and mock the theorists all at once. The Changeling, too, was highlighted on this site in one of our monthly mini-previews. At the time, Lydia Kiesling implored readers to check out LaValle’s second novel, which she described as “a book that somehow manages to be a fairy tale, an agonizing parenting story, a wrenching metaphor for America’s foundational racist ills, and a gripping page-turner to usher in the summer.” If you’re still not sold, you can check out an excerpt from the book, or read our interview with the author from last year. Skulking just beyond our list – like some expectant, lovelorn dolphin admiring a human home-wrecker as he swims – is Alissa Nutting’s Made for Love, which I reviewed a month ago, and which I encourage you all to buy and read so that this sentence makes sense. This month’s other near misses included: The Art of Death: Writing the Final Story, Hillbilly Elegy, Made for Love, Enigma Variations, and The Night Ocean. See Also: Last month’s list. Out this week: Exit West by Mohsin Hamid; South and West: From a Notebook by Joan Didion; All Grown Up by Jami Attenberg; Ill Will by Dan Chaon; The Accusation by Bandi; The Night Ocean by Paul La Farge; and American Berserk by our own Bill Morris. For more on these and other new titles, go read our most recent book preview. 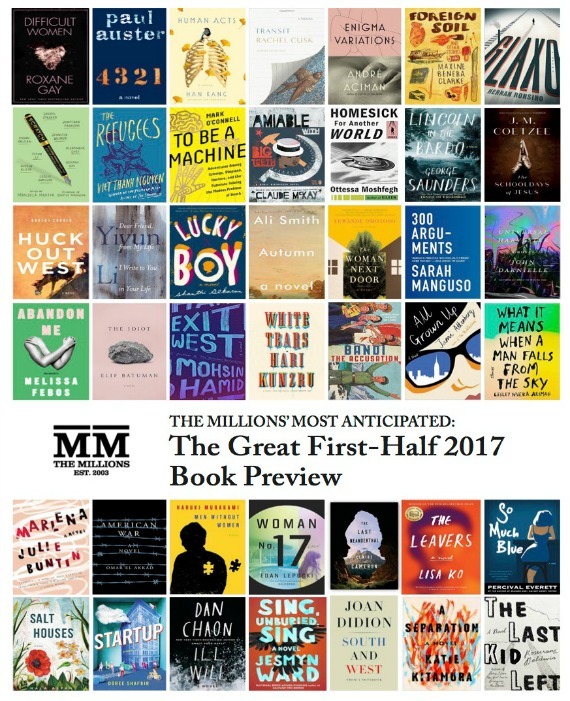 We wouldn’t dream of abandoning our vast semi–annual Most Anticipated Book Previews, but we thought a monthly reminder would be helpful (and give us a chance to note titles we missed the first time around). Here’s what we’re looking out for this month. For more March titles, check out the Great First-Half 2017 Preview. Ill Will by Dan Chaon: Dustin Tillman was a child when his parents and aunt and uncle were murdered in his home, and it was his testimony that sent his older, adopted brother, Rusty, to jail for the crime. Forty years later, he learns that Rusty is getting out based on new DNA evidence. As that news sends tremors through Dustin’s life and the life of his family, he buddies up with an ex-cop who has a theory about some local murders. As often happens in Chaon’s book, you’ll be gripped by the story and the characters from the first page, and then all of a sudden you suspect that nothing is as it seems, and you’re sucked in even further. (Janet).